How does Audible.com celebrate "ten years of great listening"? By being acquired by Amazon Here's the official press release and here's a related story from The Wall Street Journal. Audible has been an Amazon partner for quite awhile but I'd like to speculate for a moment about what this acquisition might mean in the long term. First of all, how might the Kindle play into this? Maybe down the road we'll see a Kindle that has this hybrid functionality built into it. Or, what if you don't own a Kindle but you'd like to have the audio version of the Amazon book you bought yesterday or last year? Could Amazon extend their Upgrade program to include Audible content as well? Knowing Amazon, they probably have even bigger and better ideas in mind. Either way, I like the potential new product offerings that could result from this acquisition. 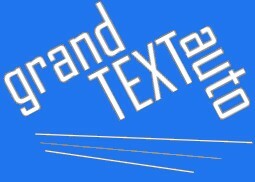 Grand Text Auto is "a group blog about computer narrative, games, poetry, and art." I stumbled across it in this Blog Herald article by Anne Helmond. One of Grand Text Auto's authors, Noah Wardrip-Fruin, is using the blog as a peer review platform for his upcoming book, Expressive Processing. Several books have been built around a blog before, of course, including our group's own Naked Conversations. What I find interesting in the Expressive Processing project though is their use of a WordPress theme called CommentPress. The typical blogging tool/platform was designed for much broader use than just book authoring and editing. That's why it's so awkward at times to comment on or read comments about book content that is being written on a blog. Questions like "what paragraph does this comment refer to?" are pretty common, particularly since all the comments appear at the end of the post with no linkage to a section in the post/chapter itself. CommentPress does a great job addressing this issue. Take a look at Expressive Processing and you'll see what I mean. For example, this particular passage called "Audiences and Processes" had 5 comments when I wrote this post. All 5 of those comments are tied to the second paragraph, hence the number 5 just below the comment bubble next to the second paragraph. Click on that bubble to display the comments tied to that paragraph. As you scroll down you'll notice that the comments box remains anchored on the screen so it's always right there for easy access. If you're writing a book on a blog or know somebody who is, be sure to tell them about the CommentPress theme. Huh? That's right. Blurb choked while slurping my blog. Blurb offers a "blog to book" service and even Stephen Wildstrom of BusinessWeek is hyping the site. I've been looking for a way to package my blog content into a book and Blurb seemed like a great solution. The content got poured into a book but it was a bit of a hodgepodge format. Some posts and comments flowed well while other posts ended partway down a page and each short comment that followed was given a page to itself, resulting in loads and loads of unnecessary whitespace. Then there were the images... It's hard to say what happened to all those book covers and other graphics I've featured with each post, but they got cropped and distorted in all sorts of ways. I eventually gave up and shut BookSmart down. In Blurb's defense, I did notice the word "beta" on the BookSmart splash screen...although it quickly disappeared and "beta" doesn't appear anywhere on their home page. Regardless, I tried BookSmart version 1.9.2, so perhaps Blurb will get these issues resolved by the time version 2.x.x comes out. Can't someone create a simple blog import tool (that works!) where the finished product is a PDF?! You're probably already familiar with the Web Worker Daily site. It's part of the GigaOM empire and it covers "the future of work in a post-broadband world." 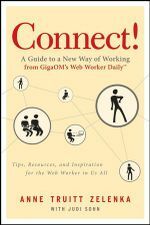 Anne Truitt Zelenka is the editor-at-large for Web Worker Daily and she is the author of a hot new publication from our group called Connect! : A Guide to a New Way of Working. Connect! has 11 chapters but Anne wrote a 12th one called Work from Home: A No-Nonsense Guide to Home-based Work. You can download this bonus chapter here. What would Google do? That's one of the questions posed in this Fortune article. Jeff Jarvis of BuzzMachine was the person asking the question and I think it's an important one for anyone involved in content creation/distribution to consider. As the article reports, Jarvis hosted a panel called "Exploding Media" and said "media companies should stop complaining and ask themselves 'What would Google do?'" He also suggested that "today's mandate is to help people distribute both their own creations and what they receive from professional media in their own way." An excellent example that was cited is the combination of Google Maps and Google Earth and how they are both made even more powerful by the contributions of users. What's the analogy in the book publishing world? What will it take for book content to be open and accessible enough to allow for customer mashups, for example? Talk about a huge can of worms... This is an extremely tricky subject given all the IP rights and other ownership issues involved. Then there's the challenge of effectively monetizing the model. Nevertheless, it's something I think will happen at some point; it's just a question of who and when. This is where I see so much opportunity for social networks and devices like Amazon's Kindle. Imagine a world where you're reading a book on the Kindle and the latest chapter/passage reminds you of a good friend. With almost no effort at all you're able to select that passage and e-mail it to your friend with a note saying, "I thought of you when I read this and I wanted you to read it too." As an added incentive, the message has all the hooks in it to give you an affiliate cut of the transaction if your friend ever winds up buying that book. How about tools like LibraryThing and the iRead Facebook application? Imagine how much more interesting and powerful those services could become if content access and sharing found its way into them. Yes, the legal issues are daunting but I am optimistic that we'll get there at some point.